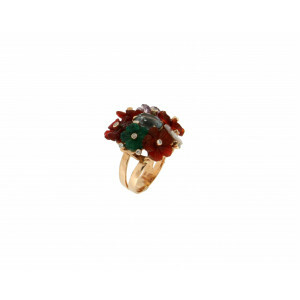 The creation of this ring is associated with the advent of spring characterized by the vivacity of its colors. The Ring is made of 14 Kt yellow gold. The flowers that surround the central topaz are specifically amethysts, carnelian, nacre and green agate. In the center of each flower there are many small diamonds. 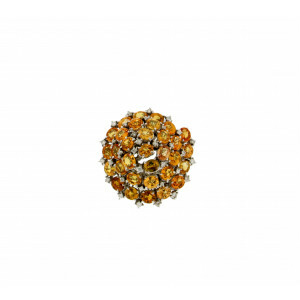 The Ring is spiral shaped surrounded by yellow sapphires and diamonds. The Ring is made of 18 kt white gold. The spiral form causes its harmony and beauty to emerge in a completely natural way and seems to extend the circular movement to infinity. 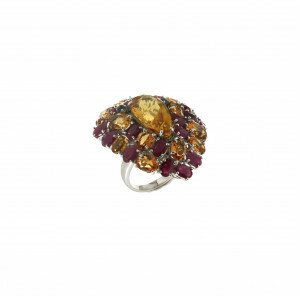 The ring represents an explosion of colors dominated by yellow and red colors typical of citrines and rubies. 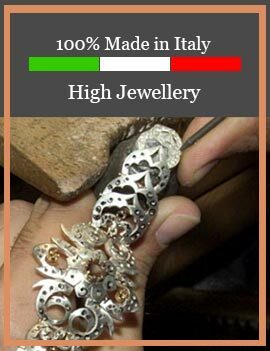 The ring is 18 kt white gold and the stones that decorate it are all natural. The Ring definitely represents a more modern style. Fabulous 18 kt yellow and white gold ring set with diamonds and turquoise elements that recall the Art Decò style. Enter your email if you want to be updated on news. You can unsubscribe at any time!